Welcome to our auctions evil doers and super heroes!!! Shipping weight does include insurance and delivery confirmation if purchase is over 20.00! Any of these knives would make a great stocking stuffer/secret santa gift. Everyone needs a great knife, even your family physician. Thanks for being a customer and great doctor, Dr. Wilson! *****Here we have a brand new Eagle Scout knife. We have 12 of these in stock! They are perfect for Boyscouts. It is 4 inches closed with a liner lock, so once the blade is open it is locked until you decide to push the lever to close the knife. You can also start to open this with your thumb and then with a flick of your wrist open the blade the rest of the way for a faster opening. 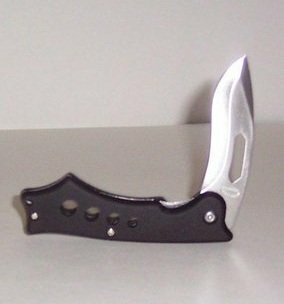 The blade is Stainless Steel and has a cut out thumb hole for easy one hand blade opening power. The handles are black rubberized and has a vented grip. The end of the grip even has a lanyard hole so you can fit this on a chain or fishing line for when you need a knife immediately. Note: With any locking knives, you may have to use it a bit to loosen up the locking mechanism or make minor adjustment to loosen or tighten the blade release to your preferences. Also, let me tell you, this rubber material is smooth to the touch and the curvature of the handle just fits right to your fingers like it was made for your hand. Just choose how many you want when you fill out the shopping cart when placing your order! If you're looking for newer knives like firefighters, police, military type designs or cool and unique pocket knives, this is the place. Once you receive your item we'd love to have you leave feedback for us so others know that are customers are completely satisfied with their buying experience. Once an order has been placed with us, we will receive an email showing how many items are in the order and which delivery method you would like (if that choice is available for that item). It will include your shipping address and should also have a working telephone number in case of any problems and we need to contact you before the item can be shipped out. We ship priority thru the U.S. postal service and at the current postal rates. Insurance is required for all orders over 20.00. If the buyer wants insurance for items under 20.00, it must be included with payment, which is an extra 2.00. Delivery confirmation is mandatory on all orders and tracking numbers will be emailed to the buyer when item has been shipped. Insurance is already included for items sold over 20.00! If we are over on shipping costs, we will refund the difference (minus H or PP fees) back to you after your order has shipped! Star Wars AOTC 3 3/4 inch Orn Free Taa Figure See Others! Star Wars EP1 3 3/4 inch Qui Gon Jinn Figure See Others!